We are a group of traders and developers that have been involved in Forex Trading for over 25 years. As a collective we have earned over 100 million dollars. Now, we embark on a new journey to try and bring light to the Forex Robot community. We feel that our compelling expertise and responsive support team will turn the corner for any Forex Trader that has been losing with MT4 Forex Robots in the past. It takes some work, but with our help and our system you will be able to make the money you have been promised so many times before, all you need is Forex Steam. The strategy for Forex Steam is based on market matching. Which means the EA calculates the current trend and then attacks it looking for sharp entry points at the start of the trend and build upon this as it rises. With this in mind we recommend that you use DEFAULT settings. We will change the settings and email you updates when needed. If you feel comfortable enough with the EA we do urge you to test and tweak it to the best of your abilities. The Steam software has many different elements and we add new functions requested by our clients monthly in our free updates. 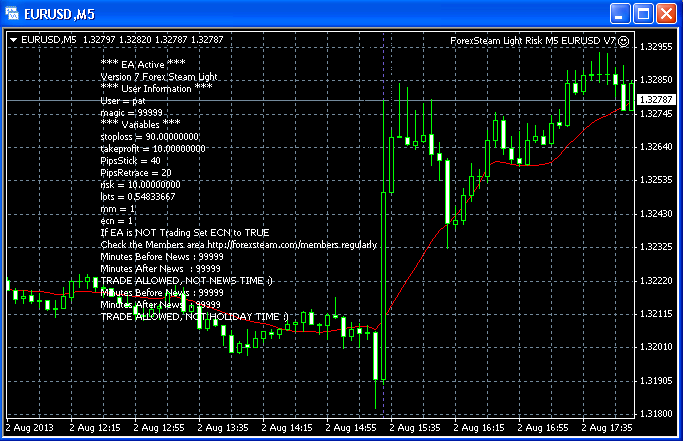 On the chart the Forex Steam system will provide a print out. Here you can see the printout for the light risk version. We have been spending more time with updates for this version because it’s grown very strong and efficient recently. When you purchase the software you get both the light and the normal version with no extra charges. Click on the image on the left to see the chart print out. You will be able to see multiple variables including the advanced News and Holiday filter which stops the system from trading in bad market conditions. Every day we learn more about this software and how to make it better. The ability to customize the Forex Steam software is something that is getting a lot of attention in the Forex community and we consider ourselves a market leader. If you click on the image to the right you will see the holiday function. We provide a Forex robot that has a proven track record that includes the ability to change functions that drastically impact the way the system thinks and trades. This is very advantageous to our long term customers who have tweaked Steam to fit their every want and desire. If you click on the image above you will see the news filter which will let you customize the system to stop trading certain news events. Such as, high impact news events, medium impact news events, and low impact news events. By default these settings are already set to give you the best possible results.